There are nearly 5 million 16- to 24-year-olds in the U.S. who are neither in work or in school. 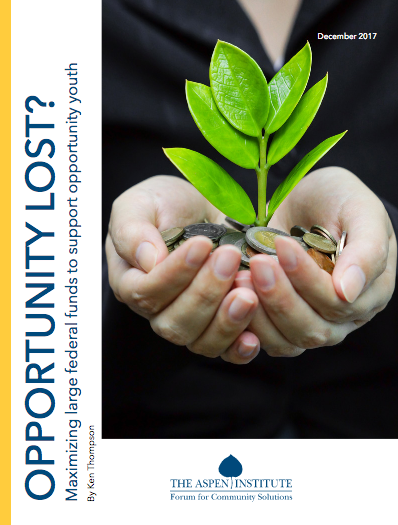 While there are some federal resources available to meet the needs of these young people, community organizations report that the rules surrounding use of these funds can hinder, rather than help, young people. Our report, Opportunity Lost? Maximizing Large Federal Funds to Support Opportunity Youth, investigates the ways in which the existing federal funding streams of WIOA, TANF, SNAP (food stamps) Education and Training, and Pell Grants are challenging to use and hard to combine – even when it would be in the best interest of the young person and the community to do so. The report looks at three compelling case studies of young adults who are trying to succeed in school and work, and notes where the complexity of their needs (for childcare, for housing, for working and going to school at the same time, etc.) run afoul of the detailed rules for eligibility and use of these federal funds. The report highlights where their hard work to succeed is obstructed, rather than helped, by the very funding streams that are supposed to support them. These four federal resources, while totaling billions annually, are not large enough to meet even a fraction of the needs of the five million opportunity youth in our country. One of the major challenges of these funding streams is that they are constructed to operate independently of one another, yet many opportunity youth experience problems simultaneously and therefore require several supports at the same time. Due to the complexity of accessing these funds, some communities may not be fully using TANF to support opportunity youth, or are even aware that SNAP Education and Training funds could also be used to support this population. Many of the changes that can make these funds more useful and usable for providers of services do not necessarily need legislative action; many times it is a matter of local rules or historical practices that can create challenges in use of funds.